When I was young, I remember that all my friends collected something which they could bring back as a souvenir from holidays and days out and keep on display in their rooms. Some collected erasers, some pens, and my collection was keyrings. 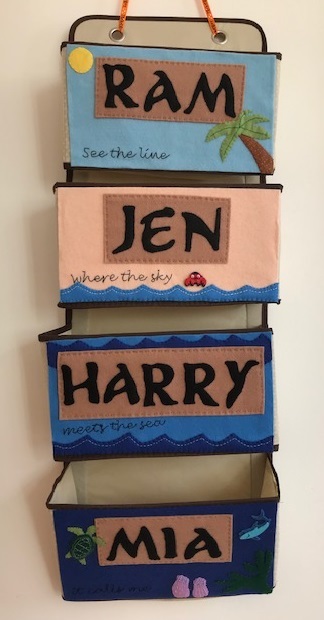 As a child, my Dad built me special display racks to hold them, using planks of wood and cup hooks, and I took great pride in arranging them my colour and type. I've thinned down my collection over the years and I now keep them in a pretty tin, but I love going back through them and reliving the memories of where I bought them. Some of them are now attached to bunches of keys that I use regularly. Even though I don't officially collect them any more, from time to time I still pick one up if I've visited somewhere particularly special. I still remember the excitement of visiting the gift shop after a day out and choosing my keyring. Sometimes there was a limited choice, and sometimes there was a huge range. Where possible at first I would try and buy an embossed blue leather keyring with the name of the attraction. In later years I tended towards plastic ones. I liked to buy matching sets if I could, and I was thrilled when I was able to find matching plastic keyrings from three of the Disney parks. I've been trying to interest the children in a collection. Mia isn't particularly fussed (although she has plenty of plastic nick nacks and stuffed animals building up in her room), but Harry showed an interest and he decided that he would like to collect magnets. So the last few times we've been on holiday we've treated him to a magnet from one of the tourist tat shops (Mia generally comes out with another stuffed toy). He chooses ones that are interesting to him, the bigger and more colourful the better, and he proudly displays them on his radiator. These days I still like to collect things. I wrote a little bit about the things that I bring back from my travels, and I have a huge collection of leaflets and postcards from places that we've visited all around the world, neatly sorted in boxes by country. I also like postcards, especially the free advertising ones that you can sometimes find at the cinema or in hotels, and I have lots left from my student days when I used to stick them up all over the walls. I keep ticket stubs, programmes and nice paper bags, and selected printed ephemera relating to current events like the Royal Wedding, or the release of a popular film or book. The main thing about my collection now is that it is mostly free, and easy to dispose of if I feel the need to cut it down! I also have a collection of craft things, in particular buttons, pens and felt, but I do use it regularly so it's not too bad. Did you have a collection as a child? What do you collect now? Yes I remember! I think I have a few of those around!